Richard Carrier is a very careful guy! Or maybe it was his publisher? I would have dumped the subjunctive mood and called this book, "On the Improbability of a Historical Jesus." But then, maybe that's why he writes books and I don't! When I first downloaded his previous book, Proving History, I was expecting the content of this second volume. Yet for me, the first volume was a necessary, if exhausting, introduction to the application of Bayes's Theorem to historical analysis. If you have not read it, I recommend it with the following caveat: it is not an easy listen. 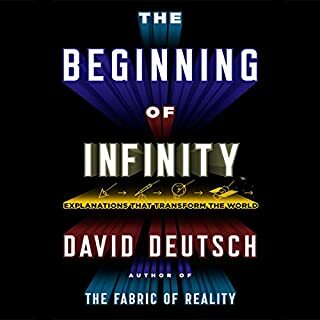 Most of the negative reviews of this book out in cyberspace seem to be of two types: ad hominem on the one hand, and what I'd call "nickel and dime" on the other, by which I mean that people object to various and sundry bits of Carrier's argument but never address the fundamental process by which he builds his case. As I noted in my review of Proving History, Carrier's approach requires historians (and the rest of us as well) to face down biases, which most of us would rather avoid. 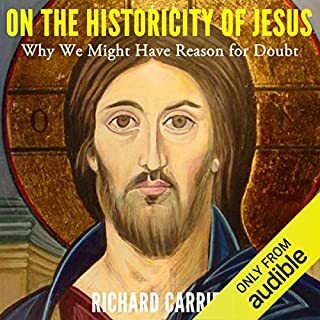 Other Audible reviewers have noted that they are avidly awaiting worthy rebuttal of Carrier's argument that Jesus was most likely mythical, as am I. In my mind, a worthy rebuttal must either be a reasoned rejection of his analytical process or acceptance of the process with a reasoned rejection of his determination of probabilities. I much prefer the latter because collaborative determination of probability increases confidence both in what we know and what we don't know. Well, I've decided that the publisher probably is responsible for the title. Richard Carrier is a careful historian, but timid he's not. 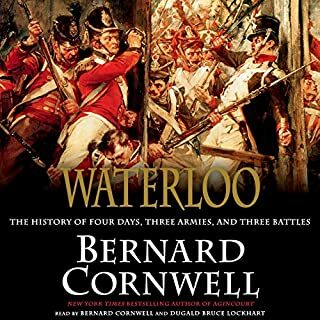 Bernard Cornwell asks in the first few lines, "Why another book about Waterloo?" It's a good question and it has a very easy answer: If Cornwell wrote it, that's reason enough for me. In his hands, the story comes alive again in a way historians only rarely achieve. Clearly, Cornwell has been researching the Napoleonic era all of his life. From the lowest private to the commanding generals, the story is told from the viewpoint and in the words of the participants. The battle descriptions are classic Cornwell, but it is the descriptions of the strategies of the battle captains, Wellington and Napoleon, that was most interesting to me. I have only one criticism: Cornwell should have narrated the entire book himself. Not that the narrator did not do a great job, he did. But Cornwell's own voice is clearly that of a passionate author and actor. Usually I prefer that authors not read their own work, but in this case I have to say we would have been better served if he had. 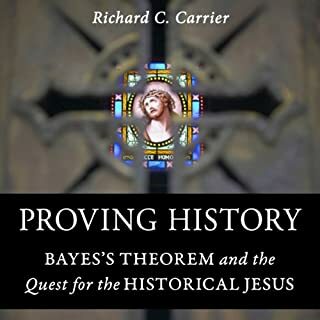 Richard Carrier's book is more about the application of Bayes's Theorem to history in general than it is about the historical Jesus specifically. No doubt, many people are put off by the idea of using mathematics to separate what is likely true about the past from what is not, but what is our knowledge of things past if it is not fundamentally uncertain? Personally, I like Carrier's approach. It gives a consistent formality and structured process to determining what most likely actually happened, given all of our evidence, while taking into account the presence of uncertainty. Carrier says over and over again that it will not work if historians are not honest with themselves and with their colleagues. I suspect that at the root of opposition to this approach is that its use requires facing down our biases, never an easy thing to do. I am neither a historian nor a mathematician. This book was not easy for me to plow through, but it was worth the effort. My white board is covered with forulae that I'll be thinking about some time to come. I look forward to Carrier's next book. The reader did a very good job, in spite of the fact that a lot of the text was equations and formulae. Recruited by a foreign power in postwar Paris and sent to Washington, Winston Bates is without training or talent. He might be a walking definition of the anti-spy. Yet he makes his way onto the staff of the powerful Senator Richard Russell, head of the Armed Services Committee. 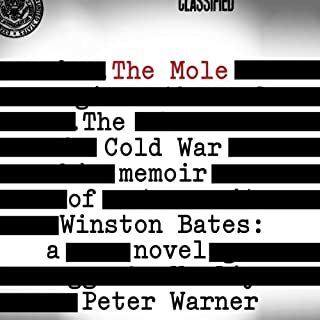 From that perch, Bates has extensive and revealing contacts with the Dulles brothers, Richard Bissell, Richard Helms, Lyndon Johnson, Joe Alsop, Walter Lippman, Roy Cohn, and even Ollie North - to name but a few of the historical players in the American experience Winston befriends - and haplessly betrays for a quarter century. This is quite an extraordinary spy novel. Winston Bates is sort of a brilliant Forrest Gump, a man with a talent not only for finding himself at the center of every failed Cold War clandestine operation from Suez to Iran Contra but for inadvertently causing some of them. He knows every high level player in US intelligence. He trades in gossip and the funny thing is, nobody in Washington seems to be able to keep a secret. Bates' photographic memory and his success on the social scene place him in the perfect places to gather information. At every turn, he tries to do the right thing but for 40 years he has no idea why he is spying or what he is supposed to accomplish. Peter Warner's Winston Bates manages to capture the supreme absurdity that I remember so vividly from the Cold War. BTW, a lot of this novel is realized in conversations. The reader's performance brought all the characters to life, but especially Winston Bates. This book is vintage Baldacci, literally. When I downloaded it, I thought I was getting the latest new Baldacci novel. By the time I was halfway through it, I had to check the copyright date, which turned out to be 2002 (Audible release date 4/2/13). I would not be surprised to hear that Mr Baldacci wrote this in the mid '90s. No kidding. The tech in this novel is severely dated. We've had several generations of computer and communications technology since 2002. Most of the youngsters using computers these days probably have no idea what a floppy disk is or why anybody would use a telephone modem to connect to the internet. And why would anybody have a cell phone that can't do a google search or take a picture or tell you exactly where you are. What? No texting? Oh, yeah, right...that's how things were in the deep dark distant past, back when FBI agents were luddites who used Smith-Coronas. Well, in spite of the historical nature of this novel, it is a pretty good thriller, one that I recommend. Also on the plus side, the reader did a fine job. I just wish that Audible had made it clear when I "pre-ordered" this audiobook that I was getting an 11 year old novel. 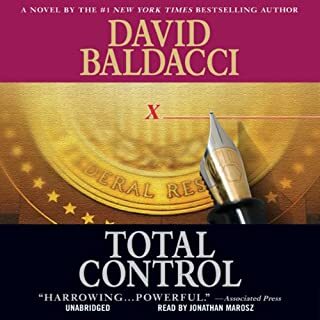 I might have saved my credit for Baldacci's latest. I'll be checking much more closely in future. Why are atheists angry? Is it because they're selfish, joyless, lacking in meaning, and alienated from God? Or is it because they have legitimate reasons to be angry - and are ready to do something about it? Armed with passionate outrage, absurdist humor, and calm intelligence, popular blogger Greta Christina makes a powerful case for outspoken atheist activism, and explains the empathy and justice that drive it. This accessible, personal, down-to-earth book speaks not only to atheists, but also to believers who want to understand the so-called new atheism. I am an atheist and I am pissed off! Until Richard Dawkins came along and so elegantly skewered religion with his razor sharp intellect, I did not self-identify as an atheist but as just another former catholic. And then I was hit by the triple whammy in quick succession: Richard Dawkins, Sam Harris, and the late and truly lamented Christopher Hitchens. I have never looked back. Yet, as good as their arguments are, they did not prepare me for the barrage of vitriol that most atheists face when they come out. And that, in a nutshell, is what Greta Christina's book is all about. Religions, she argues, exist on the continuum between good and evil. Some religions may be less evil than others right now, but the trend over time for all religions is toward evil. A few religions are explicitly evil, but the majority that are not lend credibility to those that are and thus they aid and abet evil. 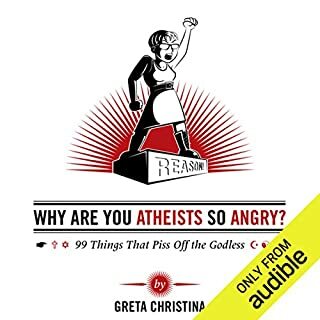 Dawkins et al provide the intellectual arguments against belief in the supernatural, but Greta provides nuts and bolts arguments that I can put in my back pocket for the next time someone tells me that I'm no different from the believers . She is angry, it is true, but her arguments are reasoned, not shrill, and her anger fuels the impulse to try to make things better. I am angry right along with her because, for example, I loved the Boy Scouts but can no longer suppress my revulsion. Hitchens liked to say that religion as a way of understanding the universe belongs to the childhood of our species. This book is a step along the way toward leaving our imaginary friends behind, growing up, and taking responsibility for ourselves in the one and only life we get. I read this novel years ago, but when I saw the movie, I knew I would have to listen to the audiobook. I really liked the movie, but by the time I'd finished the audiobook, it was clear to me (once again) that movie-making is really an exercise in making compromises. As I listened to George Smiley slowling peeling back the many layers of deception, many of which the movie barely hinted at, I found myself completely drawn again into the story in that way that only a great novelist can do. As Smiley walks the cat back, the tension builds slowly but inexorably toward exposing the bane of all counterintelligence operations, the dreaded mole. While the movie was excellent, two main characters, Percy Alleline and Toby Esterhaze, were completely miscast as simpering morons. 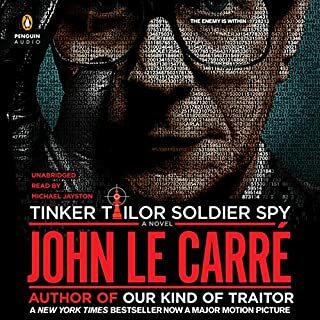 That said, Gary Oldman and Colin Firth nailed Le Carre's main characters so completely that as the audiobook played, I did not have to imagine what George Smiley and Bill Haydon looked like. I already knew. It's been said before, and I agree, that Le Carre is not a great spy novelist, but rather a great novelist who happens to write about spies. The reader did a superb job. His rendering of George Smiley's understated voice was spot on. This is History done right! Can you call an audiobook a "page turner?" Well, maybe not, but the authors are such masters of their subject and display such eloquence and insight that I found myself saying, "Wow, that was interesting! What's next?" This is not your average dry and dusty history book, that much is for sure. Well, to be fair, history did give them a wonderful cast to work with. Alexander the Great, Ptolemy Soter, Pythagoras, Archimedes, Aristarchus, Eratosthenes, Julius Caesar, Cleopatra, Mark Anthony, Claudius Ptolemy, Philo, Caligula, Caracala, Hypatia of Alexandria and many, many more. 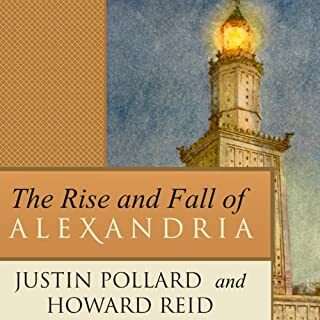 From the story of Alexander himself laying out the streets ca 300 BCE to the final dousing of the candle of knowledge before plunging in to the dark ages ca 600 CE, this is the story of a city like no other before or since. It was born from a vision, lived and flourished, and then like all good things, it died, the victim of its own brash nature and (in my opinion) the ultimately destructive forces of greed and revealed religions. But along the way, Alexandria taught us how to think. This is a great read. The reader doesn't get in the way of the text, which is the third best thing you can say about a narrator. What did I expect for a 2 hour audiobook? I am not sure what this audiobook was trying to be. The reader is excellent, but this is not a history of ancient Egypt, certainly. While there is an excellent narrative of Egyptian mythology, the rest of the book seems to be aimed at an audience of third graders. I should have known, since it's only 2 hours and 25 minutes long. You can't even scratch the surface of 3000 years of Egypt and the Pharaohs in that amount of time. And that's what this audiobook does: it fails to scratch the surface. If you want a real history of ancient Egypt in audio form, seek out Professor Bob Brier's efforts for the Teaching Company.